This compilation of units place value worksheets provides an ideal platform for kindergarten and students of Grades 1, 2, and 3 to comprehend the concept of ones, tens and hundreds place value. An extensive variety of activities include identifying place values, writing equivalent place values and much more! Solve our engaging word problems and use our exclusive MCQ worksheets to gauge a student's understanding of place values. A number of free printable worksheets are up for grabs! Observe each number. 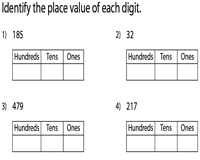 Identify and write down the digits in the appropriate place value boxes (hundreds, tens, ones) provided. A number of intriguing word problems have been thrown into the mix for variety! 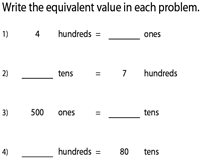 Balance the equations with equivalent place values of ones, tens or hundreds. Use the 'Download the set' option to obtain this collection of select worksheets. 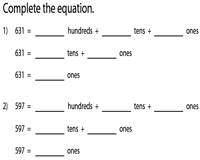 Read each 3-digit number given in this set of worksheets. Then, convert the numbers into expanded place value form according to the formats provided. 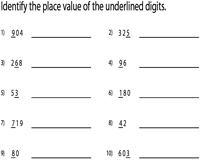 Determine the place value of the underlined digits in each number featured here. Record your answers in either number form or word form. Solve our well-researched word problems, as well! 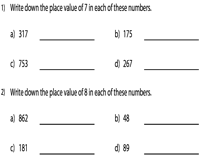 Students are required to identify the place value of a specific digit for each series of numbers provided. Look up the answer key to help them verify their responses. 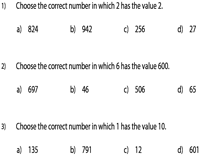 Based on the digit and the place value given, select the correct number from the choices provided. Use these worksheets to help young learners grasp the concept of units place values. Rearrange each set of digits to arrive at the largest / smallest tens or hundreds possible. Compare the units, tens and hundreds place value to verify your responses. Word problems included. Place value of digits is given in the form of hints. Interpret them to ascertain the mystery numbers. Keep young learners busy with these intriguing units place value worksheets!